Great value product, gives good gear changes even on non SRAM gears. Held as spare to replace same when worn. Useful split link, easier than shiimano pin. Can be easily removed for cleaning etc. A capable and easy to fit chain. For the price it is difficult to beat even by paying twice as much. The weight difference between this and higher end chains is just grams. I can't see the point in buying anything else. I have run shimano chains up to this point but wanted to try something different after I snapped the old one. So far this is holding up well under high pressure pedalling. Looking good! Always go back to SRAM chains when I need a new one. Simple with the power link no faff fitting. A well made chain which will work well on my every day bike. The gold connectors are much quicker and easier than shimano pins. A good weight and excellent quality for price. Good Strong chain. Powerlink is far too stiff, shimanos is a lot better. Very good value for money. Not the lightest chain in the world, but you wouldn't expect it to be for the price. It's strong and well constructed. The quick release link is coloured gold, which makes it much easier to identify. Very good value for money. I'm using this chain with a Shimano 9 speed Sora setup. The shifting is good and I can tell no difference from KMC and shimano chains. The power link is similar to style used by KMC and is easy to fit and is much better than the re-enforced pins that shimano use. On the down side SRAM say that their power link is not re-usable unlike the KMC version. Excellent chain for less than a tenner. Excellent value chain. Very easy to fit. Works well with the Sram PG 950 cassette. Will definitely buy more. No need to spend more for the sort of cycling I do. For the price I paid I can't imagine I could have got a better chain. It works perfectly with my Race Face rings and Shimano cassette and derailleurs. It seemed well lubricated as supplied, though I applied some more myself of course. How long it will last only time will tell, but I anticipate a decent life out of it. Excellent chain for the price, all four of my bikes have the same chain. Good, reliable chain, supplied with a powerlink, nothing else to add. Does what it should do. Great chain, good value, the power links make taking them off for cleaning very easy. I find they last longer and shift better than shimano and SRAM chains around the same price. Been running these chains for years, at 17st they're the only ones that do the job. My transmission has been rebuilt using this and the other parts I ordered at the same time, and my bike is running very well. Seems much better quality and to change gear better than the Shimano HG chain. Sram chains has been my personal choice over Shimano and other brands for years. I have tried other chains but find Sram easy to adjust, connect and disconnect, shifts well, last well and I have not snapped any. 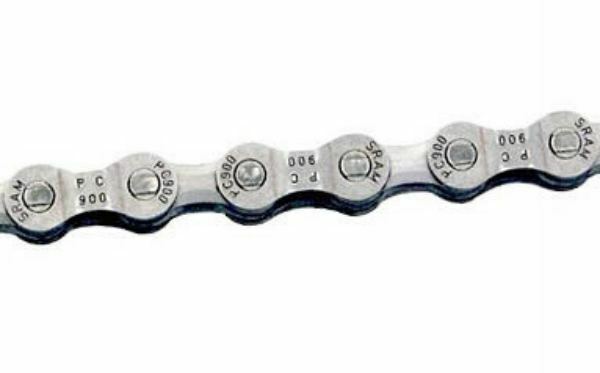 This economy chain (951) seems to work as well as more expensive Sram chains but does not look as good.